My classes begin in this way: With phone in hand, I say, "Please put your phones and devices away," and thereupon put my own in my bag out of sight. I then say, "The Lord be with you." (And also with you.) "Let us pray." I then offer a prayer, usually the Collect for the day from the Book of Common Prayer. After the prayer, we get started. And for the next 80 minutes (or longer, if it is a grad seminar or intensive course), there is not a laptop, tablet, or smart phone in sight. If I catch a student on her phone, and Lord knows college students are not subtle, she is counted tardy for the day and docked points on her participation grade. Only after I dismiss class do the addicts—sorry, my students—satiate their gnawing hunger for a screen, and get their fix. "The [French] revolution wanted to save Jews from Judaism, turning them into rational citizens untroubled by strange ancestral superstitions. It ended up taking just as persecutory an approach as the Church and the Christian monarchy. The legacies of Christian bigotry and enlightened contempt are tightly woven together in the European psyche, it seems, and the nightmares of the 20th century are indebted to both strands. Dissertations are strange creatures: written by many, read by few, important to none but the authors. In a way, dissertations are like the angels of St. Thomas Aquinas, not species of a genus but each a genus unto itself. 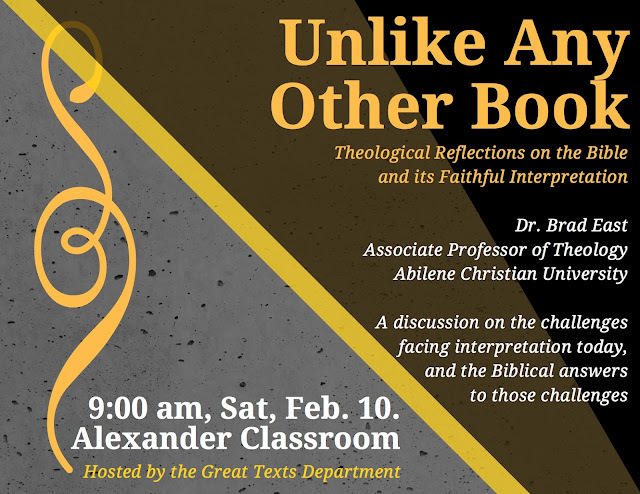 Tomorrow morning I am giving a lecture to some undergraduate students at Baylor University; the lecture's title is "Unlike Any Other Book: Theological Reflections on the Bible and its Faithful Interpretation." The lecture draws from four different writings: a dissertation chapter, a review essay for Marginalia,an article for Pro Ecclesia, and an article for International Journal of Systematic Theology.